I'm pleased to share my new design for custom revolver target pistol grips. Currently I have the Colt D-frame and Smith & Wesson K, J and N-frames ready to go. If you shoot a Python, or other revolver, let me know and I'm sure I can get you set up too. It took me a while to get a design I was happy with, but I think I’m really on to something. I’m new to revolver shooting and wanted to figure out how I could shoot single action at the short line. The single action trigger on my Smith and Wesson K-38 is one of the most pleasurable breaks I've ever pulled. With stock grips, every time I tried to thumb the hammer with my strong hand I’d end up loosing my grip on the gun such that reindexing would take too much time and would never be very clean anyway if I got back into position in time. I started by experimenting with some of my semi-auto target pistol grip designs combined with the revolver frame. Those were one failure after another until I realized that the way you grip a semi-auto is way different than a revolver. Once I started with a stock revolver grip and began working from there, it all started coming together. First came a supportive palm shelf, then a nice fat arcing thumb shelf. And finally the key to working the hammer in rapid fire was a shelf that comes over on top of the strong hand’s trigger-finger knuckle. This gives you a solid place to brace against when thumbing the hammer without loosing your hand position on the grip. 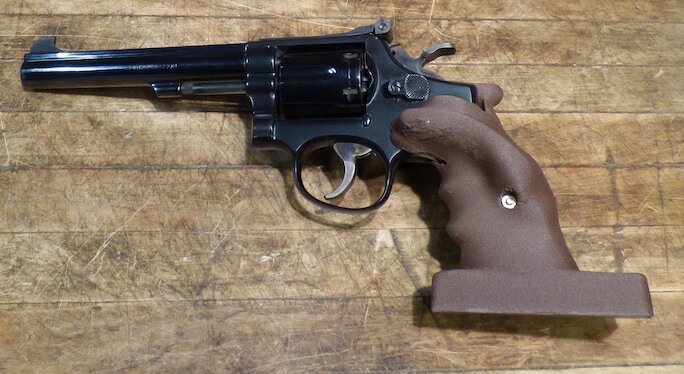 The grip's design is unlike any revolver grip I’ve ever seen and I presume that is because it just isn’t really manufacturable in wood. But with the design flexibility and inherent strength of 3d-printing, this design is possible. Like all of my grips, each one is custom made to the measurments of your hand and if you’re not satisfied, let me know and I’ll give you a full refund. To get the measurements needed to make your custom grip, please watch this short video. After you've got the measurements, just head over to the custom grips section of the website and place your order. Grips are available in all colors of PLA (a plant-based polymer), as well as three shades of a wood composite material that feels like wood in your hand. The video below on the left gives you a tour of this grip with a little additional background. It also give instructions on how to measure for your own custom revolver grip. Finally, take a look at the video on the right to see me dry-firing five shots of rapid fire single action. Note the ease at which I can thumb the hammer without breaking my grip on the gun.